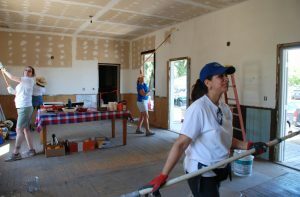 Volunteers representing Windermere Real Estate paint the inside of a room at the B Walker Ranch special needs adult day program building, off Abernathy Road, on Friday. (Amy Maginnis-Honey/Daily Republic). Ma and Pa Kettle Ranch house evolves as part of our programming in the Daily Republic article. Soon to be remodeled into a 1200 sq ft gathering place for our weary Ranchers. “B Walker Ranch will have an alpaca barn and alpacas. The animals work well with young people and those with special needs, Pamela Hale Mitchell said. Click over for the full article on the Daily Republic.